In the Railway Collision Avoidance System (RCAS) research project, DLR researchers have developed a complete system for preventing train collisions, which does not rely on any fixed infrastructure. The Bayerische Oberlandbahn (BOB) is a collaborative partner, having made one of its 'Integral' type regional trains, shown in this image, available as a test vehicle for RCAS. The technology is now ready for the market. 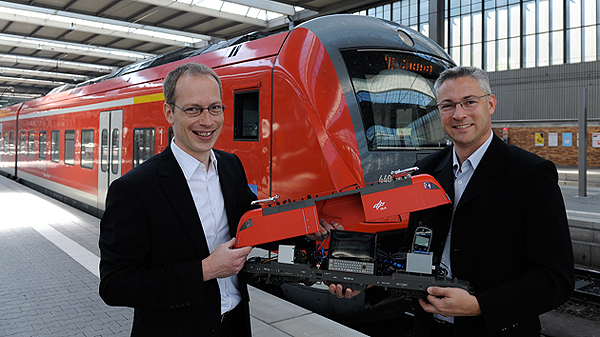 Having founded their company, 'Intelligence on Wheels', the two DLR researchers, Andreas Lehner (left) and Professor Thomas Strang, are aiming to establish Railway Collision Avoidance System (RCAS) technology on the open market. RCAS has been under development at DLR since 2006, and is designed to prevent train collisions. Whether on high-speed lines or regional services, the consequences of a train collision are often devastating. Researchers at the German Aerospace Center (Deutsches Zentrum für Luft- und Raumfahrt; DLR) have developed a radio-based communications and positioning system that allows such collisions to be prevented. After extensive testing, two DLR researchers have founded a company to exploit the technology from the Railway Collision Avoidance System (RCAS) research project. 'Intelligence on Wheels' is the name that DLR colleagues Thomas Strang and Andreas Lehner have chosen for their company, which is based in Gilching, near DLR's site in Oberpfaffenhofen. "We are delighted to have taken a major step closer to bringing RCAS research into real operation by registering this company," says Strang, the CEO. The doctorate IT specialist from the DLR Institute of Communications and Navigation has been heading the RCAS research project since 2007. 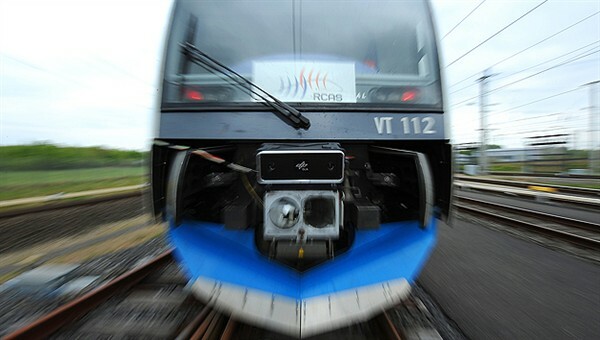 In this initiative a special anti-collision system for trains has been developed. What started off as a mere idea has evolved into a marketable technology thanks to the joint work conducted with researchers at the DLR Institute of Transportation Systems and the Institute of Robotics and Mechatronics. "DLR Technology Marketing assisted us with the formation of a spin-off company and confirmed that RCAS demonstrates appropriate market potential," reports Strang. Every RCAS unit consists of one communications and one positioning component, which are integrated into the train driver’s cab and operate independently of the trackside infrastructure. The system records every train parameter that could play a part in a collision – position, speed, braking capability or loading gauge excess – and sends these directly by radio to every train in the vicinity. "Any train that receives this data can compare it to its own parameters and thus constantly assess the current traffic situation on the line," explains Andreas Lehner, the Technical Director of Intelligence on Wheels. If the system detects a critical situation, it warns the driver or takes control of the braking process. Direct communication between RCAS trains relies on an independent radio network that operates without a base station. "In a major shunting yard, a system like this must be able to cope with, potentially, some 500 units transmitting simultaneously within a range of five kilometres," says Lehner, describing the challenge they face. The DLR researchers have now succeeded in locating trains reliably and accurately using a combination of different sensor systems. Construction vehicles or track workers can also be fitted with RCAS, to make the picture of the area as complete as possible, thus minimising the likelihood of collisions. In this way, RCAS will enhance existing railway safety systems with new technology and increase overall operational safety. The technology was first tested in a Bayerischen Oberlandbahn (BOB) train in May 2010. "Measurements on the BOB rail network showed, for example, that even in a worst-case scenario and under extremely difficult operating conditions, such as at maximum speed, the available braking distance is increased by a factor of more than seven from the point where RCAS first receives signals from another train and can make an initial safety assessment," explains Strang.